My MGB was originally built using parts from a factory MGB V8. But the factory conversion was very weak and didn't really work very well. Here are photos from the restoration and original V8 conversion. The photographs show my MGB as purchased from my uncle in late 1995. I was looking for a car to run around in and decided that an MGB would be ideal as I had lots of parts left over from my MGA that would help with the maintenance. The car looked tatty and had been vandalised during storage in a lock up garage. The price was fair but neither myself nor my uncle had realised how poor the condition really was. New sills had been fitted fairly recently but these turned out to have been fitted on top of the old sills (even the tell-tale castle section has been artfully replaced). The floors and a crossmember were also a bit scruffy so I decided to replace them at the same time. The rear inner wheelarches needed replacing as did chunks of the front corner. I ended up replacing all of the exterior panels apart from the roof, bonnet, and scuttle top. The picture on the left is from one of many occasions when I trial fitted the exterior panels to line them up and pretend that I was working on an actual car rather than just a collection of rusty bits. I don't think this convinced anyone. Cleaning off the remaining underseal was a messy job but had to be done as it had hardened and was cracking. I painted the underside with a zinc based primer followed by a couple of coats of Smoothrite and a coat of Shultz underseal. I wasn't particularly bothered about the underside looking shiny but was planning to use the car all year round. Painting a car is definitely something to be avoided. It took me about a year to prepare and paint the exterior panels. Next time it will go to a paintshop and will be painted in durable 2 pack. I used cellulose, flattened between every other coat. The top coat was flatted with P1200 paper and polished to a nice shine. I'm not sure how it happened but Stuart persuaded me to do a V8 conversion. I was offered one of the original factory V8s which had been written off by a rear end shunt after only 45,000 miles. The factory only made about 2,500 of these cars. It might have been better to rebuild this car with a new shell but as I already had a restored shell I ended up using the parts in that. It was about this point that the house we were renting was sold and we had to move. I trailered the bodyshell to Leeds where it lived in my mother's garage for a few months. Here is where it all started to go horribly wrong. Seven of the cylinders from my low mileage engine were in mint condition, still with the original honing marks. Unfortunately one cylinder had been badly scored. Things went downhill from there. The engine rebuilder made a mistake and rebored the cylinders to the wrong size! Pistons were available in this size but were extremely expensive and it worked out to be more cost effective to re-sleeve the engine to 3,900cc. The rebuilder did the additional work for free. The front spoiler is intended to direct air into the oil cooler and the lower part of the radiator (and not just to try to out boy racer a certain flatmate). For cooling I retained the original twin fans which are visible in the photographs, and fitted a 13 row oil cooler with thermostatic control. This was the first time the car could be driven under it's own power since I bought it (but before the brakes were working). This technicality didn't stop me from doing a few laps around the well. I was sharing a large Georgian house in Cheshire at the time which had a courtyard with a well which we used as a racetrack (overtaking was possible). The restoration was carried out in the stables. The leather used throughout the interior is Connelly hide from Scandinavia (where there is no barbed wire to scar the cattle), and the carpets are from Wilton. The headlining is in West of England cloth. A Rolls-Royce coachbuilder did an excellent job, making the trim mostly using the original MG parts as templates. The coachbuilder has a business making very fine trim for classic cars and I can forward any inquiries to him if required. Performance figures are difficult to judge as the speedometer needle swings about in a 1970s drive movie fashion. Working off a stopwatch we reckon 0-60mph takes just under 6 seconds and 0-100mph somewhere near 15 seconds. Surprisingly the car never feels quite as out of control as one might expect for a 175ish horsepower MG, although I do plan to make some more modifications to the front suspension damping to give some pretence of actually being in control. 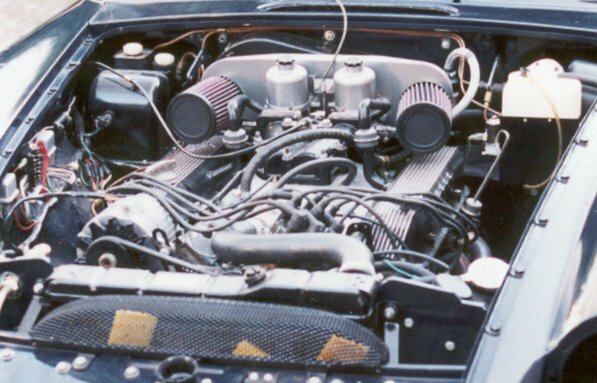 The early Range Rover specification engine (with which the MGBV8 was originally fitted) looses a lot of strength when re-lined and the weakened block can crack. This happened to my engine block after only 15,000 miles and the engine now needs to be replaced. The car has been in bits for just over a year now. I've decided to fit a mega powerful 3.9 engine with R380 gearbox and SD1 rear axle. The Front and rear suspensions will be modified to improve control and damping. Have a look at the current progress on this MGB V8 conversion.